A Bangladeshi policeman covers the mouth of prominent photographer Shahidul Alam during an appearance at a court in Dhaka on Aug. 6. Photo: Suvra Kanti Das. On Aug. 1, a speeding bus struck and killed two students in Dhaka. That incident triggered widespread outrage, spurring tens of thousands of students to pour into the streets in protest, bringing city traffic to a standstill. Demonstrators stopped vehicles and demanded to see drivers’ licenses, a move meant to point out the weakness of license enforcement that can lead to such accidents. The students kept emergency lanes that are normally clogged with traffic open. BBC and other media have reported that more than 4,000 pedestrians were killed in traffic accidents last year. Shajahan Khan, the country’s minister of shipping who has ties to powerful transportation unions, fanned the flames when he questioned why students had not protested a recent crash where 33 people were killed in an Indian bus crash the day before. Many see the crackdown as a show of force ahead of elections, which are currently slated for December. The following is a statement from Atish Saha, a Bangladeshi photojournalist and performer based in New York who won the OPC’s 2014 Madeline Dane Ross Award along with Jason Motlagh for coverage of the Rana Plaza building collapse. Saha has been closely watching developments in Dhaka. The ruling party turned these protests into a showdown, and used power politics as a demonstration of their might as the election comes near. The protests quickly turned bloody, with stick and machete attacks against students, sexual assault against female journalists, as well as shutting down the phone networks and reducing internet speed to suppress communication. The scariest demonstration of power was against people recording the government’s violence; many renowned journalists were violently beaten. Many of my friends’ cameras were taken either by police or by student goons working for the government, a group known as the Bangladesh Chhatra League. Three groups attacked the students: police, Chhatra League goons wearing helmets, and a mob of others hired as muscle. These groups attacked student protesters only 10 minutes from my home in Dhaka. The streets were shrouded in tear gas and fear. 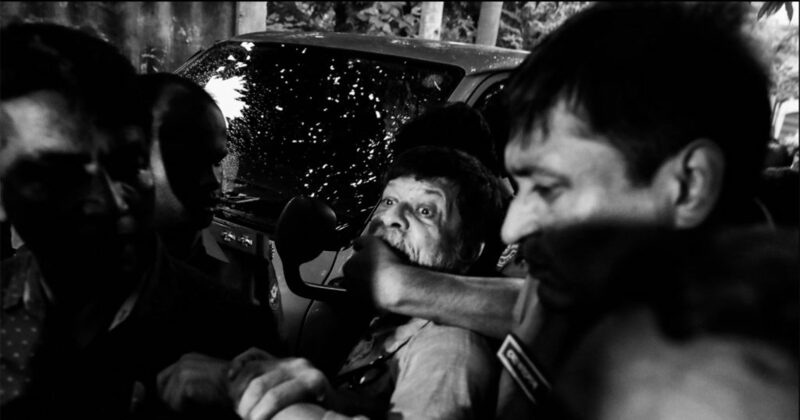 Intellectuals in Dhaka were nearly silent as Shahidul Alam, acclaimed photographer and activist, was arrested and tortured in police custody for talking to journalists about the protests. The sense of fear in Dhaka is palpable. Many of my friends are asking me not to communicate with them because of the climate of fear the government has created. We have heard reports that Bangladeshi police raided residential areas and universities, searching students’ cell phones to check for connections to the protests. 22 students were taken into police custody. A prominent actor was also detained. Alam is still in custody despite support from organizations around the world. His requests to be released on bail have been denied again and again. He has been in prison for nearly 80 days since he was arrested on Aug. 5, and his legal rights have been stripped away. When he first appeared in public after his arrest, he shouted to onlookers before police covered his mouth to stop him from speaking and shoved him into a microbus. “I have been beaten, and [police] washed my bloody clothes and made me wear them again,” he cried out. Now, imagine conditions for the 22 students, who are not known and have no international support like Alam. Local transport systems have refused to allow kids to board busses. Teachers have forced children to make political statements against their will, as instructed by the ruling political parties. Police arrested a university professor Maidul Islam in September for speaking out on social media. He has been in custody since September on charges that he made “defamatory” remarks against the prime minister. I am calling for the immediate release of Shahidul Alam and the others who has been arrested under this savage law. Voices must not be silenced. Dhaka does not want dictatorship. We will continue to write and speak out against this crackdown.